ACE Packaging & Crating, Inc.
A PRL Certified Wood Packaging Facility. Welcome to ACE Packaging & Crating, Inc. ACE is about offering you exceptional service and choices... 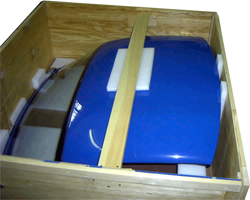 Whether Industrial, Commercial, Residential, or eBay (Seller/Purchaser), Domestic or Export, we can provide quality economical customized crating, packaging and shipping services to meet your specific needs. Crates, Boxes, and Containers in Wood, Plywood, Corrugated, or Wood/Corrugated. Also, Custom Skids and Pallets.